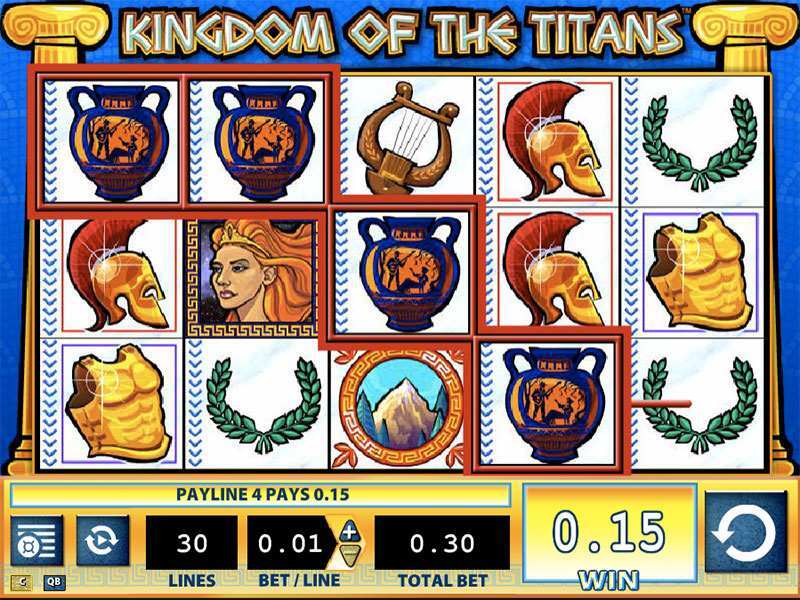 The Kingdom of the Titans online slot game from WMS is going to take you through the ancient Greek times. The game gets 5 reels and 30 paylines and plenty of bonus features and Wild symbols to give you company. The game is full of interesting features and the game is available online. Those who have a craze for these mythological and fantasy themed gaming titles shall find the game very enjoyable. There are several features like the popular Spinning Streak feature and the Jackpot bonus, which shall keep the players to come back and play again. If you love games that are not too straightforward and would wish to try your luck at some cool game, then this game is just suitable for you. The Kingdom of the Titans slots is available only in the UK. It is available to play on desktops and not on mobiles. However, it is available to play for free and for real money. Grecian theme: One of the main reasons for players to play this game has to be the theme and the theme-backed layout. The background of the reel opens to Grecian columns on both the side of the screen. Bonus Symbols: The symbols include the body armor, a female Titan, a male Titan, Amphora, Silver coins, shield, sword, musical instrument, laurel, helmet, and others. Wild Symbol: The Kingdom of the Titans logo is the Wild symbol, which comes on the 1st, 3rd and the 5th reels. There is no way for you to come across five of these in the same active line at once. Scatter Symbol: The Mountain is the Scatter symbol. Three of these Mountain scatters can give you Spinning Streak feature. Spinning Streak Feature: This feature will allow you to win anything between 8 and 50 free spins. This feature can come again too as you come across three or more Scatter again. There is no Multiplier in this feature. High Paying Symbols: If you come across five of the Male of female Titans on a line, you can get up to 500 coins. Five shields shall give you 250 coins. RTP: The game gets a reasonably fair Return to Player of 95.01%. How to Win in Kingdom of the Titans? The maximum bet coin can go up to 30 and the coin size can range between 0.01 and 5.00. So, one can expect to bet up to 150 coins and the payout of matching five of the similar symbols can give as much as 2500 coins jackpot amount. The slot machine gets the Wild symbol and matching three of these on reels 1, 3, or 5 can give you cool rewards. Likewise, matching three of the Scatter symbols can unlock the Spinning Streak feature. What does this feature offer? Free spins, as many as 50 can come to your account. In this feature, the winning symbols freeze on their place while the other symbols spin to give more winning combinations. There will be re-spins too on offer if three or more Scatter symbols appear again while this feature is on. On getting 5 to 7 Mountain scatter symbols, you get 8 free spins minimum. On coming across 9 Mountain scatters, you get 10 free spins. The lucky one to get between 11 and 15 scatters shall get 50 free spins. If you get more free spins then you also come across a jackpot of 10x multiplier on the winning amount. Play free Kingdom of the Titans casino slot machine from any casino for free or for real money. The game is shall help you earn cool jackpots and bonuses. The never-ending saga of free spins is surely going to be ideal for those who love to play with free spins. Even the Spinning Streak feature is interesting for those who love freezing reels when the winning symbols come up. Then the other adjacent reels will move churning more winning combinations from left to right. The payouts are massive then and it is also going to give you more chances to come across Scatters and more high paying symbols. The game requires no deposit, no download and it is perfect for those who love Wilds and Scatters with a twist. Though there are no big multipliers still the 10x multiplier is something that shall keep the fun factor up for those are keen for it. The game is best for all high rollers and even rookies entering this arena of gambling. 0 responses to "Kingdom Of The Titans Slot"
2 How to Win in Kingdom of the Titans?